Do all tablets have to cost hundreds of dollars? Apparently, not! Datawind just released a $38 tablet called the UbiSlate. For just $38, you know it is not going to stand up to the latest iPad or the Kindle Fire, but just what do you get for $38? That is the question! The UbiSlate is not really trying to compete with the latest Kindle or iPad, which cost about 10 times as much. Heck, it is not even really trying to compete with lower-end Android tablets that may still run a few hundred bucks. Instead the UbiSlate is attempting to bring tablets to a section of the market that has never been able to afford them. Datawind said that it is calling its UbiSlate device an “ultra-cheap” tablet. For this kind of price, you can rest assured that you are getting a tablet with dated technology. In fact, even the Android operating system on the tablet is aged. It is using an Android build from back in 2011. As far as power goes, this tablet is being compared to the first-generation iPad. So, while not great by today’s standards, it would be fantastic for someone who has never owned a tablet. Datawind has cut costs in other areas as well. For example, the tablet only has a 0.3 megapixel camera. You will not be taking any kind of high-quality pictures with this device. What are the specs of the UbiSlate? According to Datawind, it is using a 1GHz Cortex A8 processor. Yes, this is a single core processor. Thus, multitasking is going to put a real strain on this device. It does have a 7-inch display. The resolution of this display is 800×480. It comes with 4GB of internal storage and has 512 MB of RAM. That being said, the internal storage can be expanded via a microSD card. It can read up to a 32GB card. 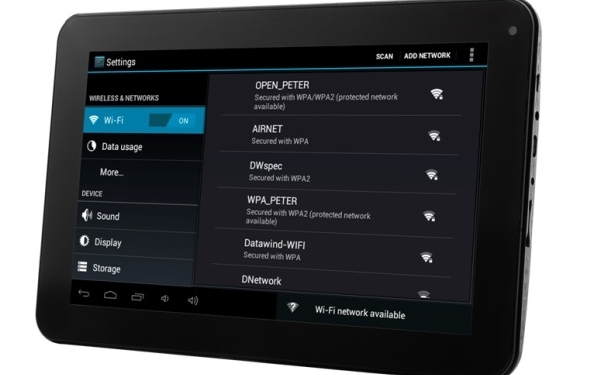 The tablet runs on Android 4.0.3 Ice Cream Sandwich. It has a mini-USB port and a 3.5-mm headphone jack. However, before you start judging this little device, remember that it is not designed for people who want the latest tech. At just $38, people who could never afford one are able to buy a tablet device. Datawind believes that this device can help get tablets into more hands in people in India. It also believes that this will be great for parts of America that have not jumped on board the technology revelation. There you have it. The UbiSlate is not going to run rings around any other device. However, it is not designed to. It is designed to be an affordable device that will get more tablets into more people’s hands. If you are looking for a higher end device, try the Windows Surface 2 Pro. Just remember that you will be spending closer to $1000 instead of just $38. Of course, you know what they say … you get what you pay for.